We provide advanced spinal correction utilizing "state of the art" chiropractic techniques. Never in the history of chiropractic have we been able to provide the level of help and expertise that now exists. These newer correction methods are even safer, more comfortable and more effective than ever before. 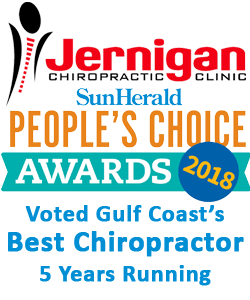 As a Doctor of Chiropractic, Dr. Jeremy Jernigan has years of training and experience in spinal adjustment. Cold Laser is an amazing new technology used in health care today. Cold laser is referred to as a low level laser therapy that is much different from traditional lasers that cut or burn. Cold laser is painless and has no thermal effect on the body. It is used to stimulate tissue healing rather than destroy tissues. These types of lasers have been in use for over 25 years and there has yet to be one recorded side effect. The erchonia cold laser emits a visible coherent light that is applied to the affected area. Bundles of light energy pass through the skin to photo receptors which exist on each cell within the body. These receptors are stimulated to trigger the cell to speed up several metabolic processes including increased circulation, increased cell regeneration, scar tissue reduction and increasing oxygen levels to the area. The overall effects of the cold laser are increased range of motion, decreased pain and inflammation, and enhanced tissue regeneration. The cold laser may help you with your arthritis, carpal tunnel, whiplash, disc herniations, sciatica, chronic neck and back pain, strained muscles or any process which triggers an inflammatory response. For more information on the Cold Laser visit www.Erchonia.com or call us to schedule your FREE consultation to find out if the Cold Laser is right for you. We provide specific recommendations on nutritional supplements and healthy food choices to enhance our patient´s return to optimal health. Do you know which supplements and vitamins are good for you? Dr. Jeremy Jernigan can provide a structured nutritional program based on your individual needs.